Scoop out some of the flesh in the center of each avocado; place into mixing bowl. Add chicken, cream cheese, tomatoes, salt, pepper, and cayenne pepper; mix well to combine. Scoop spoonfuls of chicken mixture into the wells of each avocado; top each with generous amount of Parmesan cheese. Place avocado halves, face-up, in muffin cups to stabilize. 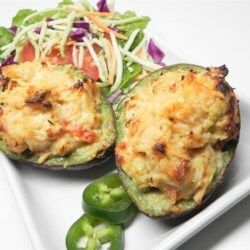 Bake avocados in preheated oven until cheese is melted, 8 to 10 minutes.